If you are like a lot of Technical Experts (Lawyers, Engineers, IT Specialists, Accountants, Financial Advisors, Health Professionals or similar) who aspire to a leadership and management role then I'm sure you'll want to make the transition as painless and stress free as possible. This special report reveals how you can successfully move into a leadership role and 10 mistakes you'll want to avoid. It will introduce you to a framework which will guarantee your success in your new role. Through out the report you will also find insightful questions to ask yourself and practical actions to take. If you are a people specialist you will also be interested in the Intelligent Leader Success Framework. It provides a development map for aspiring leaders. Let's take a look inside . . .
Report Contents Include . . . 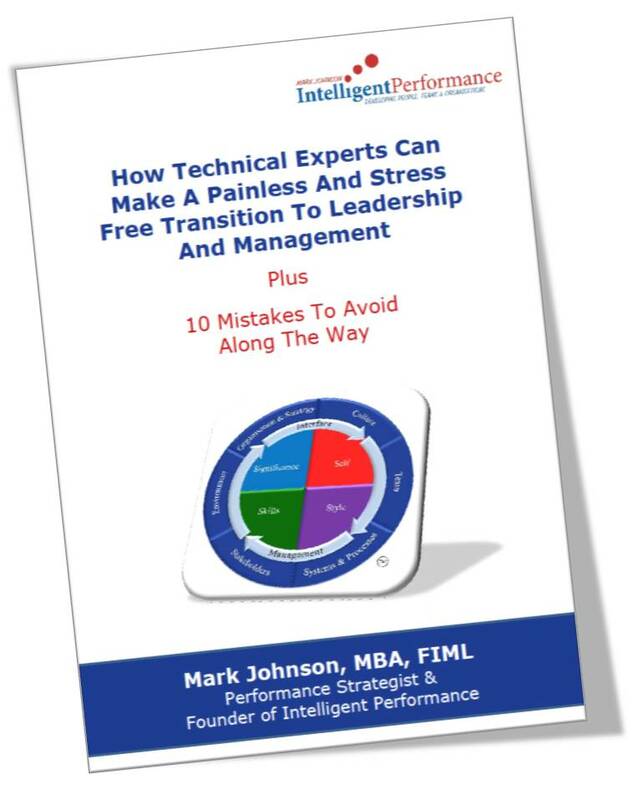 If you are a technical expert looking for a move into leadership and management or if you work with and support technical experts, then this will be an excellent starting point to ensure the transition is successful. This FREE report can be downloaded after completing a few basic details below. We follow a double opt-in process so you will soon receive an email to confirm your details. Once confirmed we will send you your free report. If you don't receive this soon, please check your spam or junk folder. We value your time and trust so we guarantee your details are never shared with anyone outside Intelligent Performance.